When it comes to promoting business online, Email Marketing is a proven strategy that helps businesses to attract new customers. These promotional emails reach to a large number of targeted customers, including those who are looking to purchase new services, or those who are willing to upgrade their services. There are plenty of email marketing services available, and most of them offer excellent features at relatively low prices. You might get confused as to which service you should use. Well, no worries! Our product research team has gone through all major providers’ offerings and plans. What Is Bulk Email Marketing? Bulk Email Marketing is an online marketing strategy which involves an outreach to people via emails. To run such email campaigns, you’ll need a software that takes each email address from the clean email list and distributes a promotional message to all of them. Based on the campaign objective, the number of recipients may range from several hundred to hundreds of thousands. It allows you to communicate with a large number of recipients in a personalized way. It’s an essential tool for those who want to leverage the email system as their promotional medium. It can be used by large organizations, small businesses, or even individuals, to run email marketing campaigns. What Is The Procedure Of Bulk Email Marketing? This process can be easily performed at your email marketing software’s “dashboard”. It consists of 4 steps mainly. First, you will need to import a contact list to your email marketing application. Before importing them, we strongly recommend you to clean your email list using any of these bulk email verification service providers. Voila Norbert’s email address verification tool is worth checking out for maintaining a clean email list. If you have hundreds or thousands of recipients on your contact list, you should place your contacts into a comma-separated file with the .CSV extension. If the CSV file size is larger than 2MB, split it into multiple files and upload your file(s) from your email campaign dashboard. Once your contact list is imported, it’s time to design your email template through the HTML editor provided by the email marketing software. Most of the email marketing applications offer thousands of ready-made email templates. You can use them, customize them according to your requirements, or upload your own. Sending emails to a targeted audience has a variety of benefits. When your contacts receive a message that is relevant to them, they’ll be more likely to pay attention to your campaigns. This will help you achieve increased email deliverability, open rate, and clicks. Ultimately, this will strengthen your relationship with your contacts, and increase the chance of lead conversion. Further, by targeting messages, you reduce the risk of annoying your contacts, with irrelevant-to-them messages. Once filtered email list is ready and you’ve already designed a beautiful template, you are ready to launch the campaign. As per your need, you can run the campaign right away or schedule it for specific time/day. To maintain the list of customers, design email templates, and send the emails, you must have a proper management system. That’s where email marketing services come into the picture. They give you a well-crafted design and email campaign management system so you can manage these activities in an efficient manner. To design professional looking email templates on your own, you would need sound HTML knowledge and plenty of time. Instead, you can get hundreds of ready-to-go email templates included with email marketing services. These templates are designed by professionals and tested for adequate viewability on all devices like desktops, tablets, and smartphones. That doesn’t mean you can’t use your own templates; you can easily import your custom designs and use them in email campaigns. Being a business owner, you keep introducing new things to your business, such as new technologies, blog posts, newsletters, events or new product launches. Email marketing service helps you to keep your customers informed of what’s new in your business. When you send promotional emails to your potential buyers, you want them to land in their Inbox rather SPAM folder. Email marketing software uses IP addresses with an excellent reputation so your emails will be directly delivered to the recipient’s inbox. You always want to know what happened to emails you sent. With manual email systems, you can’t track it. But your email marketing software will track all of this information, which will help you to know your customer’s reaction to your emails. Some email marketing applications track your social media engagement through your email campaigns, which is important to grow social media presence. Plain text emails don’t look that attractive compared to those highly visual, well-designed digital email templates prepared through email marketing software. If you are really conscious about which of your emails are bringing good customer engagements, there are some email marketing software who offer A/B testing so you can compare your customer’s preference from one email to another. With well over 15 million customers worldwide, MailChimp is the most popular email marketing service provider. Thanks to its easy to use interface and drag & drop features, you can jump-start your marketing campaign in no time. It can be easily integrated with many popular applications and services, including SurveyMonkey, SalesForce, Facebook, Twitter, Shopify, WordPress, Magento, Joomla and much more. Its robust automation tools let you use their custom autoresponder with tracking ability. You can review the list of people who opened your email campaigns and see exactly what they clicked, along with fully charted reports. It even provides a mobile app which let you check the reports, add notes to the contacts, or launch your campaign from anywhere. MailChimp provides a free plan forever which can let you add up to 2000 subscribers and send 12000 emails per month. The paid plan starts from $10/month which can let you add up to 500 subscribers and send unlimited emails. Once the subscriber limit is reached, you can upgrade to the next limit easily. If you are a beginner or a large organization, MailiGen’s email marketing services are capable of catering any requirement. Along with standard features like drag & drop template builder, email tracking, online survey, A/B split testing, social media integration, it also offers some exclusive features like subject adviser for your email campaign, Live chat support, etc. Its subject line advisor, lets you test the subject lines and provides the best suitable option. Additionally, it provides other powerful features to create more dynamic email campaigns, such as buttons, social media links, RSS & XML feeds, default text formatting, image gallery with a powerful editor, etc. MailiGen gives you an option of a 30 day free trial. Their starter plan with 500 subscribers starts at $10/month which comes with unlimited email sending, drag & drop editor, custom web sign-up forms, email autoresponders, 2 sender email addresses, 2 user accounts and much more. You can upgrade to Professional plan for additional features at a very nominal cost. Use Coupon code ACCU and get 15% discount. AWeber is one of the most prominent and well-established email marketing service providers on our list. Their email marketing solution covers a wide range of tools for small and medium-sized businesses helps them to manage their email campaigns. It integrates with most of the popular platforms seamlessly, so getting started with AWeber is super easy. With AWeber, you get plenty of ready-to-use email templates, insightful email tracking, list management, autoresponders, and much more. Each email you send through AWeber is tracked, which allows you to see emails which were successfully delivered, and how many of them were opened by your readers. Thanks to its marvelous autoresponder system, you can welcome new subscribers with cheerful and informative greetings and send subsequent scheduled emails. If you run into any problem while setting up an autoresponder or using email templates, you can check out their library of how-tos and videos tutorial series. Their support includes live chat, phone support, email support, which makes them an ideal choice for the beginners to email marketing. Before purchasing their services, you can try them out in a 30 day free trial. After that, their pricing starts from $19/month. Free Trial / Free Plan Free trial for 30 days including access to all features with 500 subscriber limits. 24/7 Support No – Support is available 8AM-8PM ET Mon-Fri & 9AM-5PM ET Sat-Sun. iContact is one of the eminent names in the email marketing industry. It offers a multitude of features to help marketers run dynamic and attractive email campaigns without any technical expertise. Its built-in spam checker ensures that your email reaches its intended recipients, by giving suggestions on your email items, and lines to be removed from the email body to help you bypass the spam filters. Furthermore, you can keep track of each mail you sent through its Smart tracking reports, whether a reader opened it, forwarded it or it just got bounced back. You can use iContact’s autoresponders to greet new subscribers and send them subsequent follow-up emails triggered on certain dates or actions. Say, for example, a reader opens your email, you can set up an autoresponder to send him another email automatically after that action. It’s a very helpful tool that keeps your business on the minds of your customers. With iContact, contact importing is fast and super easy, you just have to upload a file of contacts or add them individually. In addition, you can also copy and paste a contact list, and the information fills in the fields automatically. iContact also lets your readers share your post via a link on Facebook, Twitter, and LinkedIn. It also tracks the follower’s engagement with your content through social media statistics. You can upgrade to Pro Automation plan for additional features at $99 to $189 per month. Free Trial / Free Plan Yes – Set up a 30-day account and create a campaign with up to 100 contacts and 400 emails. Having more than 0.3 million customers around the globe, GetResponse is another excellent option for email marketing service for business. It comes with interesting automation tools which let you create your campaigns in no time. It makes things easy for you with a drag & drop template builder to create custom templates and content design for any specific group or list. It gives you professionally designed responsive forms, landing pages, A/B testing, auto-responders, tracking and much more. It can be easily integrated with third-party applications, like CRM, eCommerce applications, SalesForce, Social Media, etc. GetResponse provides a 30 day free trial which does not require a credit card. Their starter plan starts at $15/month which lets you add 1000 subscribers. You can upgrade to Pro and Max plans for additional features. Campaign Monitor is yet another popular email marketing solution, which gives you everything you would need to run successful campaigns. It comes with an easy- to-use user interface, A/B testing, email tracking, optimization, and social sharing tools. Designing an email with Campaign Monitor is easy, and done via its intuitive drag-and-drop interface. You can select/remove the elements you want, including images, text, company logos, footers with social media links, etc. Most important, you can preview an email on the desktop before you send them to subscribers. An email you design can be sent instantly or schedule the delivery. Apart from regular emails, you can also set up autoresponders to send customized automated emails by setting up a workflow on the automation tab. Once your campaign is launched, you can review the report charts, by displaying the open rate, bounces, link clicks, unsubscribes, social shares, and more. As far as support concerns, you can contact Campaign Monitor support 24/7 via emails and forums. Apart from that, they have a searchable help section with detailed articles on creating and editing campaigns and managing subscribers. We must mention here, they have extensive documentation and step-by-step how-tos to help you get started and fix things on your own. You can also use their forum to troubleshoot your issues and get tips from other customers. Further, you can contact support, and you’ll receive a reply within 24 hours. In most cases, emails are answered promptly and most issues can be solved rather quickly. Note that Campaign Monitor isn’t available on phone or chat. On the other hand, Campaign Monitor lacks third-party integration, so if you’re looking to connect Campaign Monitor to SalesForce or upload contacts from another service, you should consider another provider. You can upgrade to Unlimited plan to send unlimited emails. SendinBlue provides efficient email marketing service to their 50000+ customers in 140 countries. SendinBlue can be integrated with custom APIs, eCommerce scripts like PrestaShop, Magento and other CMS scripts like WordPress, Drupal plugins. The various features of their email marketing service include; Drag & Drop functionality for campaign creation, professional template designs, mobile friendly emails, contact management, tracking of the campaign, third-party application, and social media integration, real-time report for your campaign and much more. SendinBlue provides a free plan which allows you to add unlimited subscribers and send 9000 emails per month. Their lowest plan starts at $7.37 per month which allows you to add unlimited subscribers and send 40000 emails per month. You can upgrade your plan to the next plan anytime you need. Benchmark Email offers a simple yet powerful email marketing solution designed to help you create and send compelling campaigns with ease. Their integrated, automated and robust feature set is built to help the enterprise of any size. Benchmark Email provides three types of mail creation, a drag-and-drop editor for those with no design experience, a code editor for advanced users who have expertise in writing their own HTML code, and a plain text editor for creating text-only emails that don’t include any photos or images. Benchmark Email provides more than 400 pre-designed email templates and is categorized based on industry and theme. In addition to that, you can also customize pre-designed templates according to your need and they also provide more than 30 preset color combinations that work well together. This lets you pick a color scheme without having to go through the hassle of choosing each color separately. Benchmark Email also provides a complete photo editor in the email creator which is not provided by some other providers. Free Trial / Free Plan Yes – Free trial for 30 days including access to all features with unlimited subscribers and 250 email limit. Active Campaign combines your email marketing, automation, with CRM and sales. It comes with all the tools you’ll require to create smarter email marketing campaigns. It comes with a robust email template editor, mobile friendly sign-up forms, drag-and-drop interface, free templates, free image hosting, contact management tools, A/B testing and real-time analytics. It allows you to segment contacts based on their actions, location, behavior, and social data. It can also fetch additional data about your contacts using only their email address. It integrates beautifully with many third-party software including WordPress. You can also send SMS messages to your contacts as a follow-up on campaigns. Although the pricing on ActiveCampaign gets quite high, it’s worth the money if marketing automation is what you’re looking for. They have an excellent library of video tutorials and also provide one-on-one training. They provide limited chat support and email support but their response time is quite good, and they also provide a call back facility for your questions. While reviewing their services, we got a response within 48 hours for our email query. The best thing about ActiveCampaign is whether you are a beginner or an advanced user, they will meet all of your needs for email marketing needs. If you require more features on their lite plan you can always upgrade it to Plus or Professional Plans. Moosend is one of the newest and most prominent Email Marketing and Automation platform that has managed to incorporate a user-friendly interface with state-of-the-art features at the lowest pricing points. Within their platform, you will be pleased to find an intuitive drag-and-drop campaign editor where your imagination will be the limit when designing your next email marketing campaign. Additionally, Moosend provides you with real-time analytics and cutting-edge list segmentation capabilities across all its pricing plans. It allows you to target the right audience depending on your campaign. Moosend offers a “Forever FREE” plan for up to 1,000 subscribers which also allows you to send unlimited email campaigns (and you get access to all features). If you exceed 1,000 subscribers, Moosend’s pricing plans start at $10/month and in contrast to other ESPs no matter in which plan you are subscribed you get access to live chat, email, and phone support! Here are few suggestions you should consider before sending bulk emails. For larger email lists, you should send emails in batches as many ESP (Email Service Provider) set email sending limit. When an ESP notices five bounced emails within a certain time-frame, it may trigger a throttling message telling the server to slow down or stop the email sending process for a certain period of time. If that message is ignored, an ESP could block that IP address altogether. One of the key aspects of a successful email marketing is maintaining the health of your email list. This involves removing unsubscribed addresses, removing non-active addresses, removing bounced addresses and generally pruning and cleaning the list regularly. Send out 2 or 3 test emails to the top free email services (Yahoo, Gmail, Outlook, AOL, Hotmail, etc.) and check every link/image in those emails when they arrive. You should also send test emails to known email clients like Outlook, Thunderbird, etc. Since most of the email clients disable the images, you should also send test emails by turning on images to see how many of them show up correctly. You’ll also need to make sure that your email is displayed correctly without a horizontal scrollbar on a mobile view, as 49% of users use mobile devices to read emails. 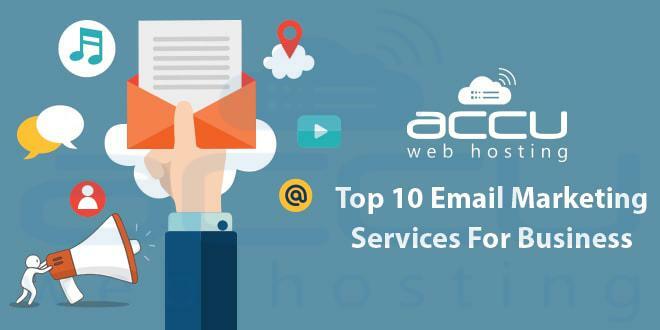 To determine the top email service providers, we reached various vendors and evaluated them on below criterion. A user-friendly marketing software can save you lots of time. We focused on below points while evaluating the providers. Ease Of Use: How easy is their dashboard to use? Image Library: How much storage they provide to store images and other multimedia contents? Email Templates: What are the look and feel of email templates? Email Preview: The preview of how the email will look to the recipient. It is crucial to know the pricing and trial policies before purchase. We checked out their billing terms on following criteria. Pricing: What is the plan price and included number of contacts. Free Trial: Do they offer any free trial? Free Plan: Do they have any completely free plan? Unlimited Emails: Do they offer to send unlimited emails? We focused on the following email sending features. Autoresponders: The service must include the autoresponder. Email Tracking: The service must include the email tracking. Triggered Responses: Sometimes you want to send emails on a specific schedule. Triggered responses become helpful at that time. Survey: This feature helps you to know your email campaign impact as per customer’s perception or buying tendency. Social Media Integration: If the service includes integration with the social media accounts. You should be able to manage your email lists in an efficient manner. Sign-Up Form: Do they provide ready-made sign-up forms which can be directly integrated on a “join our newsletter” page or other sign up forms of your website. Segmenting: The service should allow you to create certain emails like “existing customers”, social media followers or some demographic based upon groupings by country or region. Auto-Unsubscribe: This feature is extremely important so a recipient who doesn’t want to receive your email can have a reliable one-click unsubscribe link. Gmail Import: The service should allow importing contacts directly from your Gmail account. Google Analytics: How many subscribers clicked the link of your newsletter email? The Google Analytics feature called “campaigns” will gather that information. We are human beings and we always look for the quickest help available. We checked out each provider against following points. Chat Support: If the service provider offers 24/7 chat support. Phone Support: If the service provider offers 24/7 phone support. Email Support: If the service provider offers 24/7 Email support. A/B testing also known as “split-testing”, allows you to compare your reader’s preference for one email over another. Based on the results of this testing, you can decide which of your email campaigns require improvement and which are gaining your reader’s attention. We would like to give you a quick outline of this blog post. This will speed up your search for the best email marketing provider. Primarily, we talked about how implementing an email marketing service can benefit you. Then, we presented our methodology which covers various questions. Read them carefully and try to match with your requirements. Once you figure out your requirements, just note them down and go through each of the above vendor’s feature which we have listed. We are sure that you will be able to find the most suitable email marketing service for your needs. We hope this article gave you a good overview of the best email marketing services for your business. You may also want to see our list of top 10 Email Verification Providers. Explore your thoughts on this blog post under the comments section. We would love your interaction!! My Website has been hacked :: What should I do now? Very well compared features list of email marketing companies. I have been using email marketing for quite some time but never came to read a post with each unbiased details, thanks for sharing the article. I would recommend you to encircle more companies like MailGet, Moosend, Flex Mail, MailJet, Mailgen, etc. which also deserve to get featured here, as I’ve found them to be good in terms of performance as well as pricing. Thanks for the kind words and recommendations. We are expanding the list and reviewing other email services as well. We’ll certainly consider the providers you’ve mentioned here. Thanks again. Awesome post, this post talked about the email marketing. in this time, email marketing is used for the business.Email marketing is really helpful of the every business at this time. you share the information of the Email marketing. Great list! My favourite right now is GetResponse. Their marketing automation won me over. Finally an complete list of viable Email Marketing Services! Ive been using these marketing services for many years now. This list is a viable in the top ten, and unbiased by giving a fair representation of each individual service. Great article!! Since email marketing is a proven strategy that helps online businesses attract new customers, what is known success rate? I am trying to determine if the increase in profits would be enough to offset the additional marketing expense. Thank you. The success open rate varies between 15% to 27% for different industries when sent using such services compared to 2% to 5% of normal emails. Email marketing services are always helpful as they allow to create customized templates which lead to more opens and click rate. Also, they use different IP for sending emails so you can be assured that your emails will land in Inbox rather than spam folder. Good to know! Thank you so much for the reply! Email marketing is the best way to get traffic. I have been using mailchimp, which is rated 9.4/10 on your blog. But how to use email marketing? How to make the people to subscribe on my blog? Hello Anil, You can use Email Marketing tools to create beautiful email campaign which gets more click ration as compared to plain text email. If you have really good content then you can use subscribe forms on your blog and other pages, Leverage Your Social Presence, Make Blog Content Easy to Share and the list actually goes on. This is very helpful information. I am in charge of communications for a small business and have been over-working myself with e-mail communications. This looks much more feasible! Do you recommend a certain option for a small business vs. large business? We communicate with about 200 people at the moment. Thanks! Hello Ali, as you are sending emails to only 200 people, you can go for MailChimp free plan as it includes 2000 subscribers and 12000 emails/month for lifetime. You can upgrade to paid plan once your requirement increases. I agree with this , MailChimp is definitely #1. I’ve only recently learned about them and I can vouch for them. Their tracking ability is a really neat tool. You can review the list of people who opened your email campaigns and see exactly what they clicked, along with fully charted reports. It’s good for the price too, only $10/month. Going to check out the other services too. I have been slowly looking into e-mail marketing for my business and I am so glad i stumbled upon this post! Thank you for laying everything out perfectly. It has really helped me. Do you have any tips for building my list of e-mail subscribers? I currently have a small fashion business. Hello Lyndsay, Glad to know you liked the article. There are many ways to build up your list, you can try social media marketing, forms and popup on your website giving offers, Leverage ‘email only’ specials, Encourage customers with a daily deal, Encourage forwarding, Subscriber-only access and many more. I have been considering e-mail marketing for a while for my accounting business, and I came across this website. Bulk email messaging does seem like a pretty effective way to use technology as a means of spreading my business, but in this day and age email is slowly becoming obsolete. So my question is: do these websites have some sort of fail-safe if many of my emails aren’t read / sent to a spam folder where they will inevitably be deleted? As much as I want to invest in mass email marketing, I just don’t want to invest money if nobody’s going to get my email. Bulk email marketing is one of the easiest ways to market your products. You can use one of the providers to create an attractive email and send them to your list. Industry average of opening such emails is about 18 to 24 percent and click through ration of about 3 to 5 percent depending on your industry. If your content is good then you will surely get high click through ration which can drive more visitors to your website and ultimately turn into growth. Thanks for sharing this comparison of providers. It’s well organized and easy to follow. In the tips in toward the end of the post it was mentioned that users should maintain their lists, pruning out inactive or unsubscribed e-mails. Are there any good tools for list management you can recommend? Most of the bulk email marketing service provider has a built-in tool to differentiate hard bounce, soft bounce and unsubscribe contacts. However, if you are not sure if your email list contains all the legit emails then it is best to get it cleaned by Email validation and verification provider before sending email to them as getting high bouncebacks effects IP reputation. Thanks but we have listed only the best providers as per their features provided and at what cost. The list only contains the best so if others are not listed then they did not make the cut as they might be costly or the features are not there or both. Excellent article! MailChimp is one of the most popular email marketing tools. Imo Autopitch is also one of the best email marketing prospecting solutions for the lead generation, list management, email marketing with lots of other outstanding features. It provides the unlimited Free trial.